January has been productive so far with the planning permission submission to North Ayrshire Council for a new build house on Arran. This project is the first project for Thomas Robinson Architects on the island of Arran. In this case it is a house inspired by Cape Cod American architecture. The entrance to the house is via a bridge to an open plan, triple aspect, living area with magnificent sea views and a deep deck. As with Cape Cod Architecture, the main elevations are symmetrical. The entrance elevation has two circular windows on either side of an entrance porch whilst the elevation to the sea has symmetrical banks of windows behind the three timber columns of the deck. The deep deck will protect the elevation to the sea from the elements and provide a real indoor - outdoor space for dining and relaxing. Cape Cod Architecture was largely driven by climate influences and this will be no different on the west coast of Scotland. Fluctuating Cape Cod temperatures presented the problem of moisture which was addressed by using wainscoting. 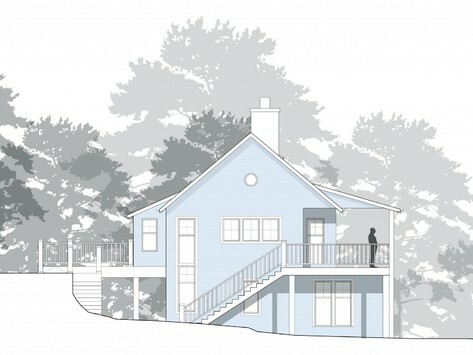 It is proposed to use horizontal, stained, larch cladding on the house in Arran. If you have a project in mind we would be happy to talk to you about it.